The Liquiproof Clean and Protect Kit is everything you need in order to protect and clean your sneakers, but can also be used for jackets, bags and other fashion items. CLEAN: Protect your footwear from rain, dirt and stains with the Liquiproof LABS Premium Protector. This long-lasting spray creates an invisible layer on fabric which repels mud, dirt, liquids and spills, as well as preventing stains from water, oils and alcohol. PROTECT: The Liquiproof LABS Footwear & Fashion Eco-Cleaner is a 100% natural cleaning solution for all types of fabric and textiles. This cleaner contains a strong concentration of cleaning enzymes that work deep into the fibres of the fabric in order to attack deep set dirt. Plus, the dual action approach from the enzymes means they also condition each fibre, leaving the fabric stain free and restoring the natural look and feel of it. 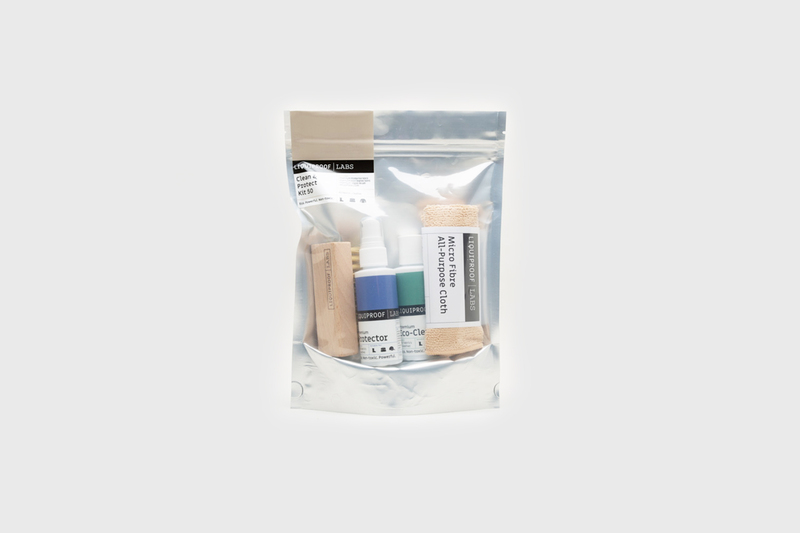 All products in this kit are non-toxic and eco-friendly, making it the perfect modern solution to clean and protect your trainers and other fashion items. Suitable for use on all non-treated fabrics including: suede, leather, nubuck, canvas, mesh, silk and cotton. Includes: Premium Protector 50ml, Footwear & Fashion Eco Cleaner 50ml, Premium Vegetable Fibre Brush and a Premium Microfibre cloth.